He thinks it's probably just rope stuck to a bridge pier. He said cold temperatures at night allowed frazil ice — a kind of loose, slushy ice that forms on water — to stick to the rope, which caused it to float to the surface. He admitted that the video looks "really cool" but the reality is "not that exciting." "It looks like it's swimming but it's actually stationary and just wading in the current," Wuttig said in a phone interview Thursday morning after watching the video. The ice looks segmented because of the current of the river. "It looks like like it's swimming upstream," he said. "But it's not organic." Wuttig has lived in the Fairbanks area since 1993. He said no giant sturgeons have ever been spotted in the Chena River. At various times of year, Bureau of Land Management Fairbanks District Office Public Affairs Specialist Craig McCaa likes to go down to the Chena River to share photos of changing Fairbanks weather. On Oct. 18, he decided to walk his camera down to the University Avenue bridge that crosses the river to snap a few pictures of ice forming on the water's surface. But instead of finding just snow and ice, McCaa saw a "strange thing" moving back and forth in the current of the murky river. "It never fully revealed itself," he said in a phone interview Tuesday. McCaa took a video and posted it to the "Bureau of Land Management – Alaska" Facebook page Tuesday afternoon. By evening it had been watched about 20,900 times. Speculation has run rampant on what the creepy object — or creature — swaying in the water might be. "I initially thought, and several people thought, it could be some rope that snagged on the bottom of the river with chunks of ice," McCaa said. "Other people have mentioned everything from sea monster to giant sturgeon." McCaa said there were some minor alterations to the video — it's slightly sped up, with a camcorder view screen and some minor sound effects added — but that the movement of whatever is in the water is not enhanced. 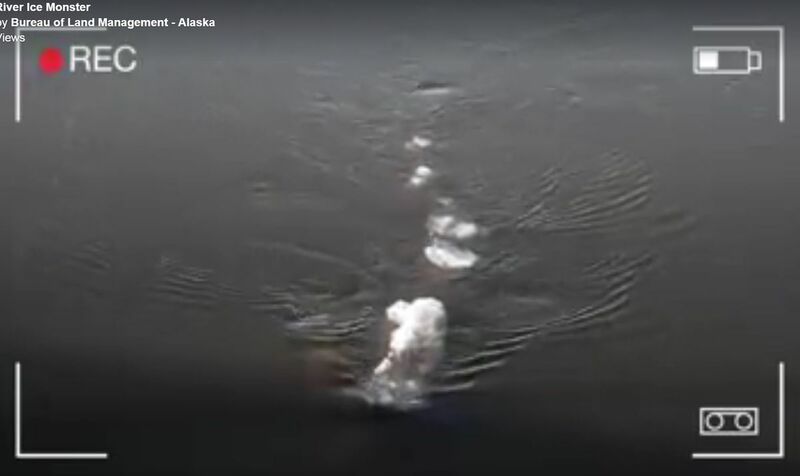 He said he watched the object — which he said was between 12 to 15 feet long — swirl back and forth in the current for several minutes, though it remained stationary. McCaa, who has lived in Fairbanks since 1994, said he has yet to show it to BLM biologists to get their opinion. He did think the spotting of the object just before Halloween was "fortuitous." "It's strange thing. I don't know what I would have done if I had come by in a canoe or something," he said of whether the object spooked him personally. "But looking from it above on the University Avenue bridge I didn't feel too threatened."